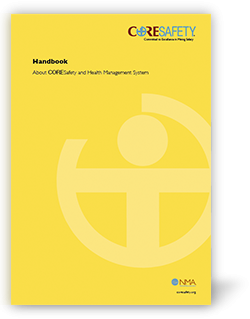 The CORE Safety Safety and Health Management System (SHMS) involves 20 modules with suggested timelines for completion. The modules and timelines were developed by mine safety professionals specifically for U.S. mining as a pathway to achieve zero fatalities and a 50 percent reduction in the injury rate within five years (0:50:5). While CORESafety provides a common roadmap and a common language to achieve 0:50:5, it does not specify the details of each company’s system. Rather, company systems should be designed to be functionally equivalent to the CORESafety SHMS taking into consideration each company’s unique operations, management structure and culture.